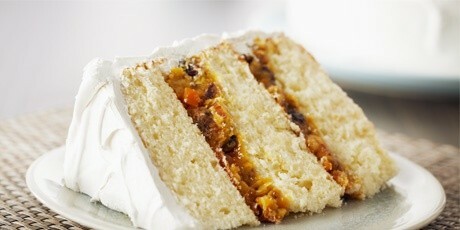 In episode Candied Orange Peel of TV show Bake with Anna Olson prepares Anna Olson recipe for Southern Lane Cake. Cake - For the cake, preheat the oven to 350 F. Grease 3 8-inch round cake pans. Line the bottoms of the pans with parchment paper and dust the sides of the pans with flour, tapping out any excess. Beat the butter and sugar well (the sugar will not dissolve, but will be granular). Sift the flour, with the baking powder and salt and add this to the butter mixture alternately with the milk, starting and ending with flour and beating well after each addition. Beat in the vanilla. Whip the egg whites on medium high speed until they hold a stiff peak when the beaters are lifted. Fold the whites into the batter in two additions. Scrape the batter into the prepared pans, spread to level and bake for about 30 minutes, until a tester inserted in the centre of the cake comes out clean. Cool the cakes for 30 minutes in their pans then turn them out onto a cooling rack to cool completely. Filling - Prepare the filling when the cakes are cooled, so that you can use it while still warm. Melt the butter in a medium saucepot over medium low heat and whisk in the brown sugar and egg yolks. Increase the heat to medium and continue to cook the mixture, whisking constantly, until it has thickened, about 6 minutes. Remove the pot from the heat and stir in the vanilla, raisins, coconut, pecans and candied orange peel. 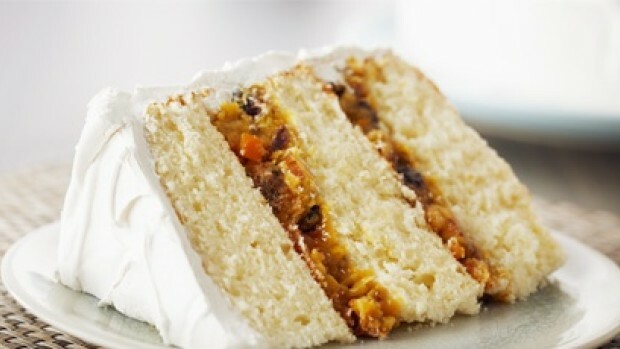 Remove the parchment from the first cake layer and place on a plate. Spread half of the filling over the cake, top with a second layer and spread the remaining filling over it, topping with the final cake layer. Icing - For the frosting, bring the water, sugar, corn syrup and salt up to a boil over high heat and ready the egg whites in a bowl. Once the sugar dissolves fully and begins to boil, whip the egg whites until they are foamy and add about 2 tablespoons of the liquid sugar, whipping the whites on high for 15 seconds. Continue to boil the sugar until it reaches 240 F on a candy thermometer. While whipping the eggs whites on medium high, carefully pour in the hot sugar (pour it down the side of the bowl to avoid splashing) and then increase the speed to high and continue to whip until the frosting cools to just above body temperature, about 8 minutes and holds its shape when the beaters are lifted. Whip in the vanilla. The cake will keep for up to 3 days.